An outdoor wedding is everyone’s dream. Scenic backdrops, sunny skies, and beautiful weather all contribute to a picturesque, romantic, and memorable day. But planning an outdoor wedding can be a huge challenge. At the Alleen Company, our team of event planners has plenty of experience with outdoor events, especially weddings. When you start organizing your outdoor wedding, be sure to follow these tips from our event planners. A tent is an absolute must for any outdoor wedding. It provides a place for guests to eat, relax, dance, and of course, get some shade. Tents come in all shapes and sizes, so regardless of the size of your wedding, you are sure to find something that fits all of your guests. At The Alleen Company, we offer tent rental services, so be sure to contact us before your big day. Depending on the time of year and the location of your wedding, mosquitos and gnats can pose a huge problem. So, before your wedding, be sure to purchase mosquito-repellent citronella candles, lawn torches, and lanterns to keep the keep the bugs at bay. 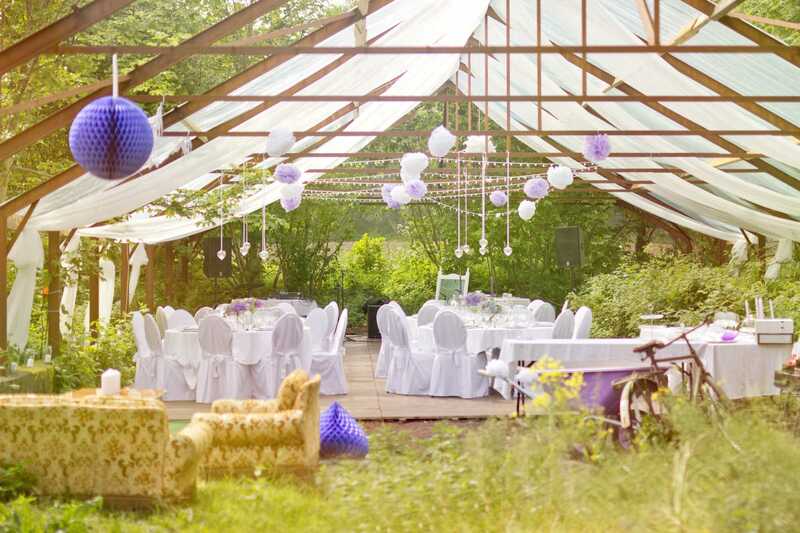 Decorating is one the most important aspects of wedding planning, especially for outdoor weddings. Whether you host your wedding at an outdoor event space, a scenic location, or your own backyard, decorating is a sure way to create atmosphere and set the celebratory mood. Before your wedding, look into renting tables, chairs, linens, and anything else that will contribute to the look and feel of your ceremony and reception. Let’s face it: sometimes an outdoor wedding simply does not work out. Despite careful planning, Mother Nature simply gets in the way of your dream wedding. To avoid saying your vows in the rain, have a backup venue. This way, even if everything goes wrong, your day will be a success. Planning a wedding, especially an outdoor wedding, is a huge undertaking. It is easy to get lost in the details, which is why you should consult with an experienced event planner. An event planner will take care of the rentals, arrangements, shipping, and other logistics, allowing you to sit back and enjoy your day. To speak with an experienced and knowledgeable event planner, contact The Alleen Company! Since 1951, The Alleen Company has provided event planning and rental services to the Cincinnati area. Regardless of the size and scope of your outdoor wedding, we have the knowledge, experience, and resources to bring your vision to life. To start planning your next event, contact The Alleen Company today!